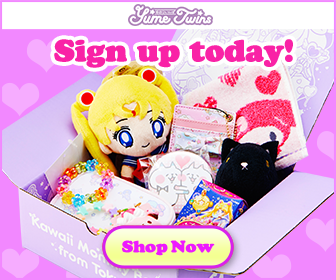 YumeTwins Subscription Box – A Box Filled With Kawaii! YumeTwins is a subscription box service from Japan that specialises in all things Kawaii! Each month subscribers receive a box filled with 6-8 items from a variety of adorable brands such as Gudetama, Sailor Moon, Hello Kitty and all Sanrio Characters. Items can be anything from soft toys to stationary and even clothes! The company also has two other subscription boxes: Tokyo Treat (for Japanese sweats and treats) and No Make No Life (for makeup/cosmetics). For YumeTwins, subscription packages can range from $35/box to $31.50/ box, however(!) if you sign up before 1 October 2017, you can get 10% off your first box. My box was the August 2017 box with the theme ‘Kawaii Summer’. This box was sent to me as a promotional box from YumeTwins (thank you so much!) and took about 2 weeks to arrive. Once I got Merry out of the way I began to look at all my wonderful treats. The box included one summer-themed hand fan, one bunny mini pouch, one chigimi plush, one bottle cozy and one face towel. The box also included a magazine which shows you al the different variations of items you can get and includes competitions you can participate in! My favourite part of the magazine was seeing the ‘Community Page’ which features pictures from subscribers enjoying their incredible boxes from previous months! I honestly can’t believe how incredible this box is! You receive so many wonderful products for such a fantastic price. I adore the idea of a subscription box, it’s like giving yourself a surprise treat each month. The items within the YumeTwins box were of such a high quality, I had so much fun looking at them and using them. I highly recommend checking out YumeTwins! Remember to order with YumeTwins before the 1 October 2017 to receive 10% off your order!